Civilian members play an important role in the Belleville Police Service. Civilians hold positions in several units such as administration, communications, records, human resources, courts, property, finance, and information technology services. Civilians are employed as permanent or temporary staff in both full and part-time employment. Some positions involve rotating shifts schedule. Civilian careers are attractive to those interested in working within a policing environment, but not necessarily interested in becoming a police officer. The Belleville Police Service offers a professional environment where career development and advancement opportunities are available. Special Constables provide court security and transport prisoners between detention facilities and court facilities. They ensure that the security and safety of prisoners is maintained. Prior to applying applicants must have an Ontario Association of Chiefs of Police (OACP) Certificate of Results for Special Constables which is acquired through testing administered by Applicant Testing Services Inc. (ATS) . You can find more information about the testing including fees, dates and site locations on the ATS website. Communication staff take routine and emergency calls from the public and relay information to police units in response to calls for service. 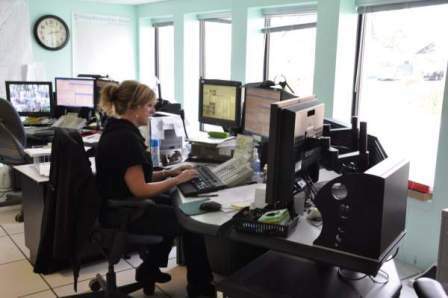 They act as a call taker/screener and switchboard operator as required and answer 911 calls for the City of Belleville, and in some cases, relay the calls to another 911 emergency agency. Transcriptionists perform data entry by transcribing police reports utilizing the Records Management System (RMS) and also perform other clerical duties as assigned to ensure the smooth and efficient operation of the Records Unit. For further information, please contact the Human Resources Unit at hr@police.belleville.on.ca.